Abhivyakti Media for Development (AMD) is a twenty-five year old Nasik-based NGO providing informal education to the underprivileged citizens in rural areas of Maharashtra. AMD uses various forms of media (plays, videos, community radio, writing scripts) as a medium in facilitating community education. Using media, AMD addresses social issues like environment, waste management, conscious parenthood and women’s empowerment. AMD pioneered in introducing media as a mode of education. Through these various forms of media, AMD encourages individuals to express themselves better in the community; thus boosting their self-confidence and improving their overall personality. AMD collaborates with like-minded groups/NGOs and caters to the communication and training needs of these organizations; thus enhancing their effectiveness as community workers by enhancing their communication and articulation skills. AMD has also collaborated with schools in rural areas promoting media as a powerful medium to education and overall development of an individual. AMD designs its own course content, publishes books, journals, documentaries and scripts. AMD has a library which is easily accessible to all and affordable to the poorest of the poor. The membership fee of the library is as low as Rs5 per month. The programmes and documentaries released by AMD are well appreciated by different audiences. During FY13, AMD reached out to 950 beneficiaries. Cost per beneficiary has been in the range of Rs7,500 to Rs6,500 for the period FY10-FY13. Total Income: Total income during FY13 was Rs4.5mn posting a 35% Y-o-Y decline (Refer Fig. 3). In FY13, a 10-year MOU executed with Ford Foundation (one of its largest donors) had expired. As a result of this, the income witnessed a Y-o-Y decline in FY13. Company sources indicated to HYNGO that Ford Foundation had expressed interest in recommencing support to AMD after a minimum gap of one year. Average contribution made by Ford Foundation each year since FY10 was Rs2.5mn. Local V/s Foreign Income: A large portion of AMD’s income is received from foreign sources. Income from foreign sources has been in the range of 60% to 85% between FY10 and FY13. Income from foreign sources had declined Y-o-Y since FY10, as the organization is making concentrated efforts to raise donations from local sources. 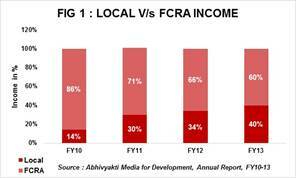 Foreign sources accounted for 60% and the balance 40% came from local sources in FY13. Donations from local sources were raised through sales and sponsorship programmes and service charges/beneficiary fees earned from training sessions held at Municipal schools. Besides Ford Foundation, AMD receives foreign donations from Bread for The World, Germany and MelJol (international funding agency based in Mumbai). Programme V/s Other Expenses: 91% of total expenses was incurred to meet AMD’s direct programme expenses in FY13. Staff expenses to the tune of 19% is also included in direct programme expenses as details for admin staff cost was not mentioned separately in the organization’s financial statements for the period FY10-13. 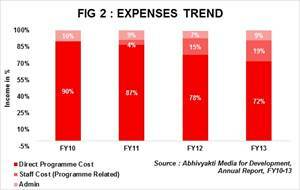 Other expenses/overall administration cost has been in the range of 7% to 10% for the period FY10-FY13. The organization has incurred zero fund raising cost and the professional fees have been as low as 1% for the same period. Accumulated Deficits: It may be noticed that accumulated deficits for AMD has increased Y-o-Y to Rs1.9mn in FY13. This is owing to declining trend of income since FY10. The NGO posted a surplus of Rs185,372 and Rs14,896 in FY10 and FY11 respectively. A deficit of Rs0.7mn was posted in FY12 and a steep Y-o-Y decline by 35% in total income during FY13 further widened the deficit in FY13. Other Current Liabilities include loan availed from members; and earmarked funds to be immediately utilized in the beginning of the next financial year i.e. FY14. Fixed Assets: For the year ending FY13, the NGO had an asset book of Rs11.06mn. Out of the total asset book, fixed assets were to the tune of Rs5.78mn (include building campus, land and other movable assets like furniture, computers etc.). Investments: The NGO made no long term investments since FY11. This is owing to tight liquidity position of the organization due to declining income trend. However, donations received during the year are invested in short term bank deposits; thus earning interest income on these deposits. Cash & Bank Balance: Cash and Bank balance were to the tune of Rs2.3mn which is attributed to donations received during the year but not utilized. Income Growth Rate: AMD recorded a negative 4-Year CAGR of 12% for the period FY10-FY13. 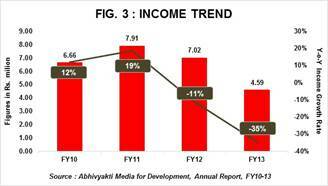 The negative growth is on account of Y-o-Y fall in income for last two consecutive years by 11% in FY12 and 35% in FY13. Assuming that Ford Foundation recommences its support to AMD, the revenue trend is likely to improve. However, it may be also be noted that despite this; unless AMD broadens its donor base, maintaining a positive income growth rate will remain a challenge for the immediate one-two financial years. Self Sufficiency Ratio: The ratio measures NGOs ability to meet its expenses from its own funds. Self Sufficiency ratio of AMD has marginally improved i.e. 30% in FY13 over 27% in FY12. This ratio when compared with education focused NGOs listed on HelpYourNGO’s website stands lower than the sector average of 75% in FY13. Inadequate Funds: It is evident from the declining income trend and increasing deficits that AMD requires strong financial support. AMD has to make concentrated efforts to widen its donor base for its long term sustainability. Lack of skilled staff: Due to low compensation offered, AMD is unable to retain skilled employees and attract qualified candidates. It is because of this, AMD is frequently unable to focus on its core activities of content creation, recording documentaries and hosting new workshops as planned. Number of existing committed trained staff is not enough for AMD to address larger audiences. AMD’s Governing Body is composed of nine eminent personalities having 75+ years of collective experience in the NGO space and in media. Co-founders Mr. Nitin Paranjpe & Ms. Anita Borkar are qualified social workers and are involved in all functions of the AMD. The Board meets every quarter to review quarterly performance and discuss the way forward. Donor relations are maintained solely by members of the Governing Body. AMD releases monthly newsletters narrating experiences of the beneficiaries. Quarterly activity reports are released to update donors and its target audience. The organization has chosen not to register with Credibility Alliance and funding agencies like Give India, Plan India and others.